As an avid hiker who lives in Las Vegas, I’m a big fan of hiking sandals when the weather is hot and the terrain isn’t too treacherous. While my go-to pair of hiking sandals are a pair of Keens, I also own a pair of Tevas and used to own a pair of Chacos. So, you can say that I’ve worn all the best hiking sandal brands out on the trails and at the beach. If you’re shopping for a new pair of hiking sandals and trying to decide between the Teva and Chaco brands, then I can help you out with the comparison below. If you just want to know what my favorite Chaco and Teva sandals are, check them out below. How Does The Durability Compare? Probably the most important thing to consider is which brand just fits your foot better and gives you a better feel when you’re wearing them. Obviously, this is a very personal thing, but I can break down some of the basics that I’ve noticed to give you an idea of what to expect from each brand. After wearing both pairs of sandals, I have to say that for me the Chacos are definitely a more comfortable fit and feel. They definitely have more arch support, which is essential for me because I have flat feet. I also noticed that the footbed on the Tevas is a lot thinner than that of the Chacos, so I was feeling more rocks and trees roots when I was wearing the Tevas. However, the Tevas do have a softer footbed where the Chacos are more rigid. You should also know that putting on the Chacos is a bit of a process. I mean, it’s not that long of a process, but definitely not as quick as with the Tevas. With the Chacos, you have to spend some time adjusting the straps so that you get that just right perfect fit before you leave the house. While this means you get a better fit and feel, it is also more time consuming. So, say you’re on a river kayaking trip, well you might want something that is quicker to get on so you can hit the water sooner. One of the things that I HATE about the Tevas is that if your feet get wet, then they slip around in the sandals. You don’t have to worry about this with the Chacos because they have an anti-slip footbed. One of the things that I HATE about Chaco sandals is that it seems to take a long time to break them in. For me, I experience around a month of wear before they really feel properly broken-in and I’m at my ultimate in comfort. But with my Teva sandals, it only took about a week for me to feel like they were good and broken in. If you prefer a more lightweight sandal for backpacking or other purposes, then you should know that the Chacos are definitely heavier. This should come as no surprise since they have a thicker footbed/sole than the Tevas. So, this also means that a pair of Tevas will take up less space in your pack (if you’re not wearing them when you set out backpacking). Chacos have better arch support. Tevas have a thinner but softer footbed. Chacos have straps that take a lot of adjustment to get the perfect fit. Tevas are definitely more lightweight. 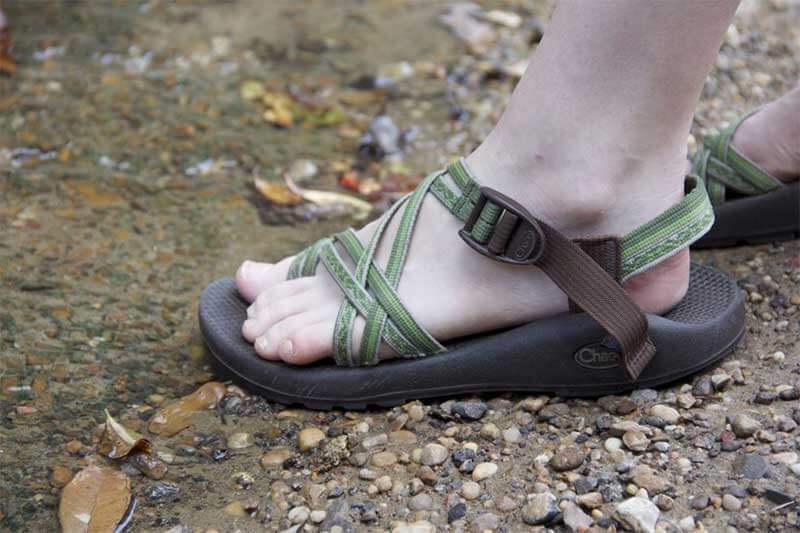 Chacos have an anti-slip footbed, which is great for wet feet. Tevas break-in quicker than the Chacos. I think it goes with out saying that both Teva and Chaco are high quality outdoor footwear brands. And honestly, either brand is a great purchase from the quality and durability stand point. That being said, there are a few things you should think about here. 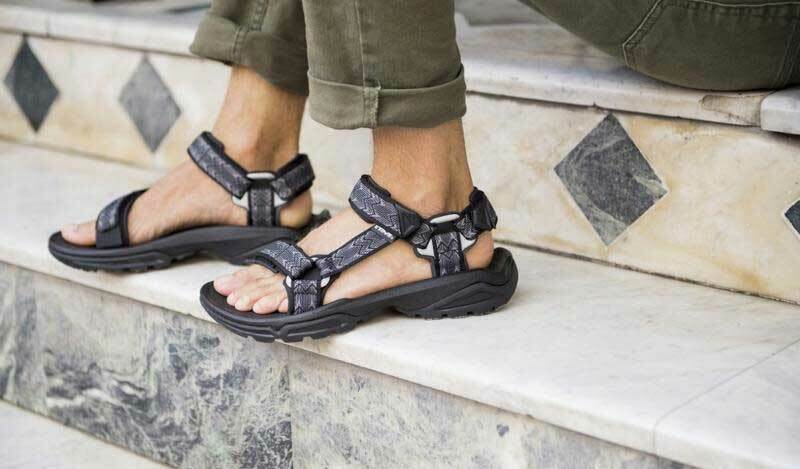 Since the Tevas use velcro straps, those can wear out over time. If you’ve ever owned anything with velcro then you know that over time is gets sort of fuzzy and stops sticking as good as it used to. And if you’re the sort of person who wears a pair of shoes until they fall apart, then remember that the Tevas have a thinner sole, which means they will be the first to wear out. Both are great, but over time the velcro and sole of the Tevas may wear out before the Chacos do. High quality footwear is never cheap, and good outdoor sandals like these are no exception. Generally speaking, it seems that Chaco sandals tend to have a higher price than Teva sandals. That being said, if you’re not in a hurry to get a pair you can probably end up getting a great sale price at some point during the year. I actually got my Chaco sandals at a great sale price at REI – and they often are discounted at the end of the season. I paid full price for my Tevas, which made both my Chaco and Teva sandals around the same price. 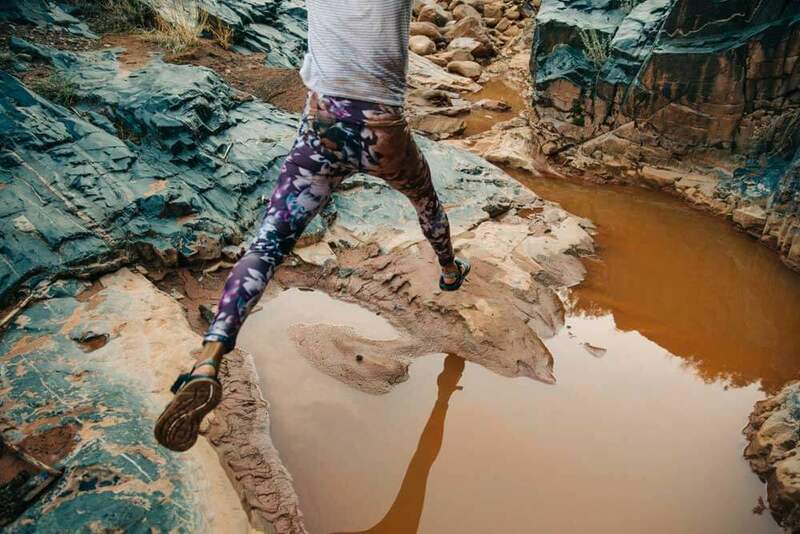 If you want the best deal on a pair of these, I suggest becoming an REI member so that you earn money back on your purchases and watch for a sale, a 20% member discount coupon (there may be one right now! ), or check the REI Outlet online store for a deal. Now that I’ve told you about my experience with these two brands, I hope that you are better able to make a decision for yourself. For hiking or any activity where my feet get wet, I prefer to wear Chacos over Tevas. For camping or every day casual activities, I prefer the Tevas over Chacos. So, I think you can’t go wrong with either brand, so pick the one that best meets our outdoor adventure needs.